Testing your pool water is a vital part of owning a pool. Today we’ll look into 3 simple ways to keep your pool water chemicals in check. Keeping your water balanced will avoid many problems such as; infections and irritations for swimmers, algae, cloudy water, green or brown water, equipment damage and pool surface damage. Liquid test kits have been around a long time and are pretty easy to use. 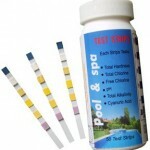 You simply take a water sample from your pool and add a set amount of drops of a special chemical to the water sample. The water sample changes colours. Then you match the colour to a chart which tells you what the levels are. You’ll need to repeat the process for every test you wish to do. These kits normally test for Free Chlorine, Combined Chlorine, pH, Stabiliser, Total Alkalinity. By far the simplest way to quickly test your pool water. The advantage of strips is that they test up to 6 different things at once. For a water drop test kit, you need to do a new test for each chemical you wish to test for. 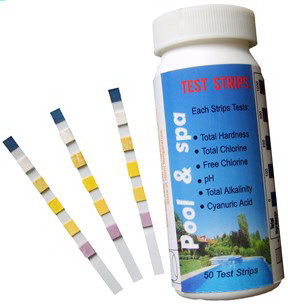 To test with strips, simply dunk the test strip in the water, pull it out and wait for 10-15 seconds. The pads on the end of the strips will change colours. You then need to compare the colours to a chart, much the same as the pool drop test kits. Whilst home pool test kits test the most essentials things, they don’t test everything. That’s where a pool shop can help. Normally pool shops offer a free water testing service. They can test for things that you don’t normally or can’t test at home such as copper, total dissolved solids and water hardness. Having your water tested this way is great. Some people only use this method and take a water sample up to their pool shop on a weekly basis. The catch is, you normally walk out buying something. No service is free! In summer, test your pool water 3 times a week or more. You’ll pick up any potential problems faster. When it comes to pools, prevention is far better than cure. Additionally, adding smaller amounts of chemicals is better not only for your pool, but for your health and your wallet. You really don’t want to be swimming in more chemicals than needed. Follow the directions of the test kit, exactly. If you don’t, you won’t get accurate readings. Make sure your test kit is fresh. You should replace it at least once a year or before the expiry date. Old test kits won’t give accurate results.